Brushes O5 (Sparkles Brushes) by apple-instinct. Create a new 1024 x 768 px document. Set the Foreground color to #344b50, and the Background color to #172327, then, create a Radial Gradient from the center of the document to one of the corners. Place the Frost texture on top of the Background layer, and change its Blend Mode to Overlay. Create the text using the font Keep on Truckin’ FW in All Caps. The Size is 300 pt, and the color is #4e737b. Change the text layer’s Fill value to 50%. Duplicate the text layer and change the copy’s Fill value to 0. This is how the text should look like. This is what you should get. Create a new layer between the two text layers and call it Snow Fill. Now, press the Ctrl/Cmd key and click a text layer’s thumbnail to create a selection. Go to Select -> Modify -> Contract, and contract the selection by 5 px. Set the Foreground color to White, then, use the brush you’ve just modified to add some snow at the bottom of the letters. Duplicate the Snow Fill layer, and drag the copy below it. Right click the Snow Fill copy layer and choose Clear Layer Style. Go to Filter -> Blur -> Gaussian Blur and type in 5 for the Radius. 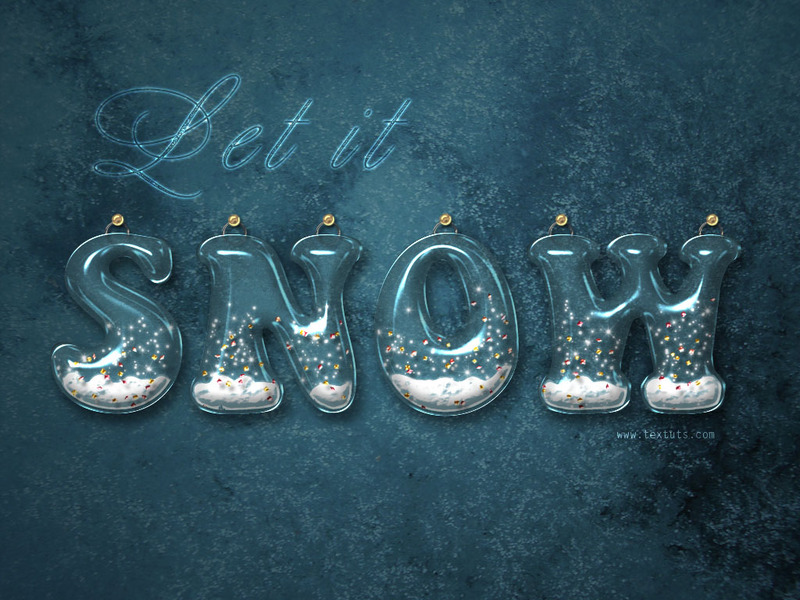 Change the Snow Fill copy layer’s Blend Mode to Overlay and its Opacity to 60%. Check the Wet Edges box. Create a new layer on top of the Snow Fill layer, and call it Snow Sparkles. 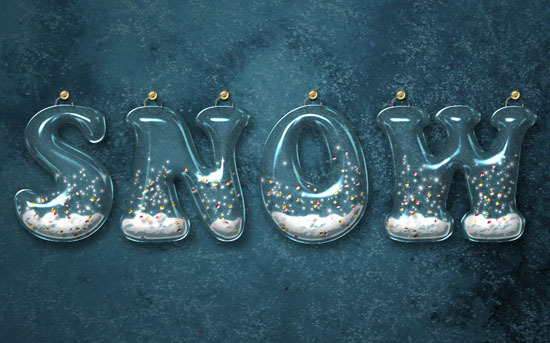 Use the modified brush to scatter some snow in the lower half of the letters. This will add a nice glow. Scatter some sparkles inside the letters. Select the Brush Tool, and open the Brush Preset Picker. Click the pop-up menu icon in the top right corner, then, click Assorted Brushes. Click Append to add the brushes to your current set. Create a new layer on top of the Snow Sparkles layer and call it Gold Particles. Gradient Overlay: You can have fun with this. Choose any gradient you like, and it will work! You can download the one used here as well. Duplicate the Gold Particles layer and rename it to Red Particles, then double click it to apply a different Gradient Overlay. This one is available for download too. Select the Gold Particles layer so that it is the active layer, and add some particles using the modified “Diamond” brush. Then, select the Red Particles layer, and add more particles. Once you’re done, go to Select -> Deselect to get rid of the selection. Pick the Ellipse Tool, and click the Paths icon in the Options bar. Then, create a new layer on top of the Star Sparkles layer and call it Hangers. Draw a small circle so that its center intersects with the letter’s top. Pick a hard round brush, and set its Size to 3 px. Pick the Ellipse Tool again, set the Foreground color to White, make sure that the Hangers layer is still selected, right click the path you created, and choose Stroke Path . Choose Brush from the Tool drop down menu and make sure that the Simulate Pressure box is un-checked. Hit Enter to get rid of the path. Duplicate the layer to add hangers for all the other letters. 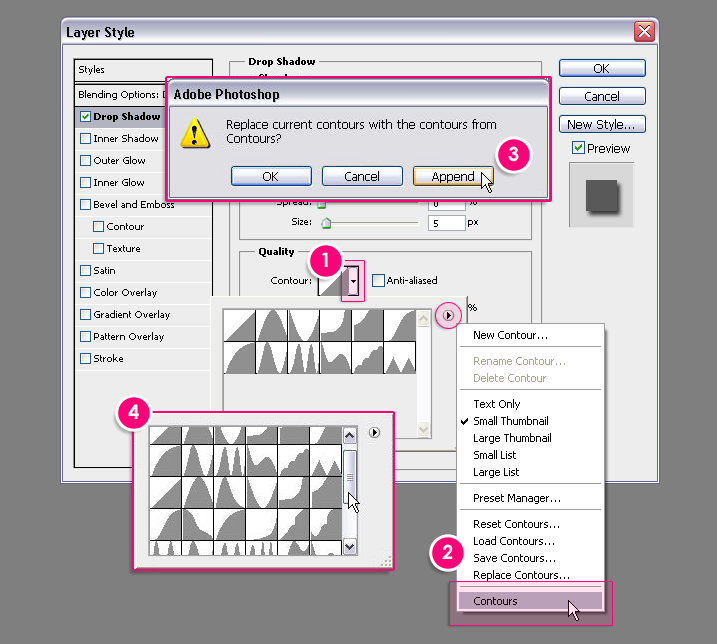 Select all the duplicated Hangers layers, then go to Layer -> Merge Layers to merge them all in one layer. Apply this Layer Style to the merged layer. Select the text (Ctrl/Cmd + click a text layer’s thumbnail), then pick the Eraser Tool, set its Opacity in the Options bar to 70%, and erase the inner half of the hangers. Once you’re done, press Ctrl/Cmd + D to get rid of the selection. Create a new layer on top of the Hangers layer and call it Pins, then, apply this Layer Style to it. Choose a hard round brush and set its Size to 15 px. clickce to add a pin on the top of each hanger. Once your pretty snow globe letters are all hung up, you’re done! Great tutorial 😀 Thank you very much! I love your Snow tutorial but unfortunately I don’t have a software program to make it. Is there any way you would share the word art with some us who don’t have programs? Thanks for the comment, but I did not quite understand what you mean by the “word art”, so can you please clarify that to me? Another great tutorial. I always look forward to the ones you write. Bravo (de Saint-Etienne, France) pour ce magnifique tutoriel !!! Glad you found the tutorial useful. thanks for a very useful tutorial. can i achieve this effect on a cs3 extended? Very nice. Thank a lot. How to click modify ? when you click Fill Snow And Snow ? Did you make sure that the “Snow Fill” layer is selected (active) before you click Modify? This is wonderful tutorial thank you. The main font is mentioned in Step 1. It is “Keep on Truckin’ FW“. Cool!!! this tutorial is amazing thanks!! Nice effect! This is perfect for desktop wallpaper during Christmas. You are really genius person. I am wondering if I could do the same way that you do. By the way I love the concept of your design. Glad you liked the effect. Thanks! It’s a great tutorial! Good text effect tutorial.This is one of my best text tutorials. I don’t have “Valley – High” . Where Can I find It ? As mentioned above, you can check this image to see how to get it. Do you mean the “Frost” texture? The link is working fine for me, but you can try the direct download link here. Hope this works. I’m so glad you liked the tutorial and found it easy to follow. Thank you for tutorial and PSD box. it is the clearest tutorial ever!!! i really enjoy doing this tutorial!! thanks a lot!! WOW! Thank you very much for the tutorial. It was very helpful. Happy you found it helpful. Love this tutorial, makes it so easy! Lovely design and nice additions. Very happy you enjoyed it and found it easy to follow. That’s amazing to know! Really glad that you were able to follow the tutorial easily and that you found it useful. Hi textuts, how to apply HangersLayerStyle… I download it and extract it , then click on it with right button of the mouse and there didn’t saw option to install it. Then just double click on the HangersLayerStyle and it show my photoshop window, but nothin change as on the picture you show – http://prntscr.com/l83uz . As for the Layer Style, the link works fine for me. Try to right click it and choose the Save or Save as option instead of clicking it directly. Once you download the file and extract it, you’ll need to load those styles inside Photoshop. Check this page and hopefully it’ll help you understand how to do so. Just choose Styles instead of Swatches. After the styles are loaded, select the layer you want to apply the styles to, open the Styles panel (window -> Styles), and click the icon of the style you just loaded. Hope this was helpful. Please feel free to add any other queries you have. I really appreciate your kind words, and I’m glad you found the tutorials helpful. Very happy holidays and new year to you too. Hey just working on the tutorial and stuck on one step.. I’m trying to fill the snow text layer in with the brush, but it keeps asking me to rasterize the layer.. I’ve done that and the snow comes up blue and not white, what should I do? You’re most probably adding the snow on a text layer (a text layer is selected). Make sure to select the “Snow Fill” layer, so that it is the active layer, before you start adding the snow with the brush. You’re absolutely right! Fixed now. i love it! thank you sooo much. where’s the ‘metal landscape’ pattern? Ow I found it! thank you. . I like your tuts.. When you pick the Brush Tool, please check that the Opacity and Flow values in the Options bar are set to 100%. The “Snow Fill” layer’s Opacity and Fill values should be set to 100% as well. If they are, please feel free to leave a reply with a screenshot of the issue. Are you using the same brush size for the pins? If so, then can you please upload a screenshot of the issue? This tutorial was very helpful. Well put together and just all around great. Thanks. Hi! I tried making this effect, unfortunately when I cannot apply the Hangers Layer Style and Pins layer Style. I loaded them but I couldn’t find them. The Hangers and Pins layer styles don’t appear on my list of layer styles. Can you please help me with that problem? I love this tutorial, by the way. It’s really fun to do! How did you load them to Photoshop? They should appear just fine. Did you try loading them from the Styles panel itself? This is amazing, Thanks for share it.